Porsche 911 Cabriolet Performance, Engine, Ride, Handling | What Car? While the Carrera’s peak torque arrives at just 2300rpm, you should have no concerns that this is an engine that doesn’t like to rev. In fact, its full 444bhp doesn’t appear until 6500rpm, and you’ll actively enjoy revving the twin-turbocharged flat-six to its 7500rpm limit. Inevitably, the Carrera S and 4S are seriously rapid; the former takes 3.7sec to get from 0-62mph and the latter just 3.6sec, although, if you don’t tick the box for the optional Sports Chrono pack, you can add 0.2sec to both of those times. Not only does it accelerate relentlessly until it hits the limiter, it makes a fantastic noise while doing so. There’s no hiding its boosted nature; you’re treated to plenty of whistles, whooshes and flutterings as the turbos spool up and then dump any unwanted pressure into the atmosphere. All that is a mere accompaniment to the distinctive howl of its six-cylinder motor, though, which urges you to stretch its legs with every note it sings. Admittedly, though, all the cars we’ve tested so far had the optional switchable sports exhaust fitted. Of course, a great engine needs a great gearbox. The latest 911 uses Porsche’s sophisticated eight-speed dual clutch automatic which responds so quickly and impeccably smoothly on both upshifts and downshifts that the car never feels unbalanced, even if you happen to change gear mid corner. Although you can’t change gear manually with its shrunken selector, a pair of paddles behind the wheel allow you to take complete control. As standard, both the Carrera S and Carrera 4S use a rather unusual staggered wheel setup, with 20in wheels at the front and massive 21in wheels that are wider at the rear. Surprisingly, despite such big wheels, the standard electronically controlled dampers do an impressive job of cushioning you from battered road surfaces – as long as you avoid setting the shock absorbers to their firmest setting. It’s true that big ridges or bumps in the road will unsettle the 911 Cario’s ride but, for such a focused driver’s car, the 911 is surprisingly comfortable. It remains remarkably flat and stable when confronted by a series of challenging crests and dips, while many rivals would throw you around in your seat. Such comfort is even more impressive when you consider we've so far only driven the latest 911 with the optional sport ‘chassis’, which drops the ride height by a further 10mm. However, where the 911 really stands out from the competition is in the excitement it can serve up. The steering’s speed is perfectly judged and your fingertips receive plenty of subtle messages about the road surface how much grip you have at your disposal. That makes the 911 not only easy to place, but it allows you to really explore what the car is capable of without fear of it snapping at you suddenly when its limits are reached – something that can’t be said about the Mercedes-AMG GT. Body control is simply exceptional; it’s supple enough to deal with sudden crests and compressions, even in the middle of a bend; but firm enough that body lean is virtually non-existent. You can also add active anti-roll bars (labelled PDCC) and four-wheel steering for a fee, but – while the latter system is tempting for the additional low speed maneuverability and sharper turn in it provides – the standard suspension is so good at resisting body lean that PDCC feels slightly pointless to us. 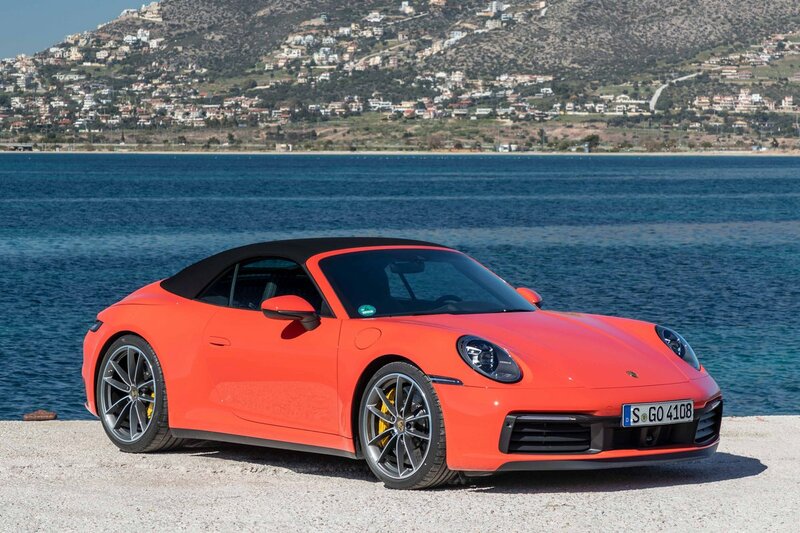 Keener drivers will find the rear-wheel drive Carrera S fractionally more engaging; its steering is that little bit smoother and more consistent by its front wheels being unburdened by having to transmit power to the ground. And, with no driven front wheels pulling you out of corners when you pile on the power, the S is also a bit more playful should you decide to slacken the stability control’s grip. Honestly, though, traction is phenomenal in the dry, even without four-wheel drive. Unless you regularly drive in the Alps, we recommend saving an awful lot of money and sticking with rear-wheel drive. 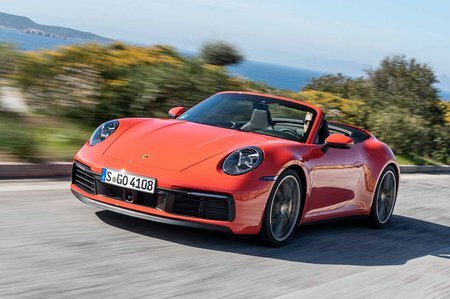 Does all this mean the Cabriolet drives every bit as well as the 911 Coupe? 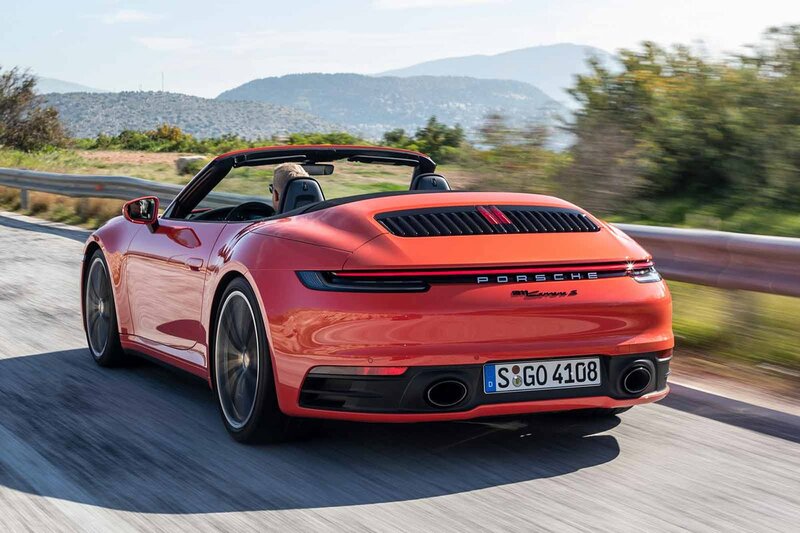 Well, not quite; Porsche may have worked incredibly hard to make the former as rigid as possible, but really rough roads do send slight shudders through the Cabriolet’s structure. It’s a bit heavier, too, but even so: faced with a winding road and the keys to the Cabrio, you’re unlikely to feel short changed. The 911s fine handling and epic traction does come a price; those huge wheels and wide tyres create a lot of noise over coarse surfaces, so the 911 isn’t the most refined machine in which to make long journeys. Wind and engine noise are both relatively well suppressed, though, and the standard electrically operated wind deflector means it’s possible to hold a perfectly civilised conversation with your passenger at motorway speeds with the roof down – assuming you’ve got all the windows wound up.